I have been a fan of Daisy and her books since I had the good fortune to read ‘Before I Left’ a few months ago. 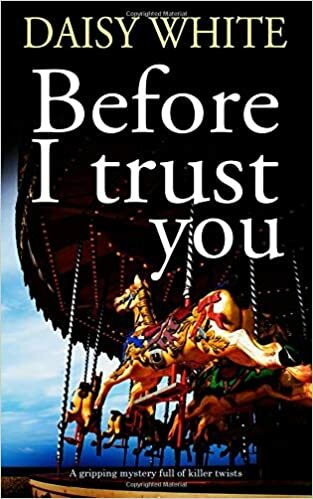 The latest book in the series featuring Ruby Baker is called ‘Before I Trust You’ and was released on 4th October 2018. As soon as I could get my hands on a copy, I dived straight in and started reading. Blooming heck it was certainly a read and a half. I absolutely, totally and utterly loved reading it but more about that in a bit. I adore the character of Ruby Baker and I took to her from the start. She’s a lovely lass, who seems to have a great deal of success in solving crimes. If something doesn’t seem right to her then it usually means that it isn’t. When Ruby takes on a case you know that she is going to investigate the matter fully even if the investigation does get her into the occasional scrape or two. Ruby is feisty and she is determined. She is also a good friend and support to those who need it. It didn’t take me long until I began thinking of her as a friend. I naturally felt very protective and defensive of her as a result. I also loved the tight friendship group that she seems to be in. They all look out for each other and they certainly have each other’s backs. I did worry though that perhaps Ruby had bitten off more than she could chew with this latest case and I worried that she was in grave danger. Oh my word ‘Before I Trust You’ was certainly one hell of a read for me. I loved the fact that the book is set in Brighton and I loved the fact that it was set in the 1960s too. I got a real sense of the everyday life in the 1960s. I was pleased to see that the author had put little snippets of history into the story. For example: when the story takes place homosexuality had not yet been decriminalised. Those that are born today might not realise just how far society has progressed in such a relatively short space of time. Indeed both of my parents say that they could remember when it was illegal and they are not that old. The way in which the young lady Rita Stonehill dies, really did remind me of the way in which Emily Wilding Davison, who was the famous suffragette and who died when she ran out in front of the King’s horse during the Epsom Derby. There were unanswered questions left when Emily died, just as there are when Rita dies. I was hooked from the moment I read the synopsis, never mind from when I began to read the book. The author’s writing style is such that you can’t fail to be drawn into the story from the first word and before you realise it you are hooked on the book and can’t stop reading. That’s certainly what happened to me. The book starts in such a shocking way and with such a memorable incident that ensures that the book will stay with me for a long time to come. The more of the book that I read, the more I wanted to read and the quicker the pages turned. ‘Before I Trust You’ is a relatively short book and it didn’t take me long to get through it. I was riveted by the story, the characters and of course the author’s writing style. Although this is a book about crime and a dead body, there’s not really a lot of gore and a lot is left up to the reader to imagine. Saying that though there were times when I almost had to read through my fingers because I feared that something bad was going to happen to Ruby and her friends, who felt like they were my friends by the time I finished the book. ‘Before I Trust You’ is certainly an unputdownable, page turner of a read. To conclude, it’s safe to say that Daisy White has another hit on her hands and ‘Before I Trust You’ is sure to be a bestseller. I absolutely loved it and I can’t wait to read more from Daisy White. I wholeheartedly recommend this author and her books to other readers. The score on the Ginger Book Geek board is a very well deserved 5* out of 5*.